Gratitude is an important characteristic to have. It can change your whole outlook on life. It may seem simpler for adults to slow down and look at all the good things in life that they can be grateful for, but when it comes to your kids, can you see them doing that? A main goal parents have when raising their children is to prevent them from growing up spoiled. The opposite of being spoiled is having gratitude. According to a study mentioned on the Wall Street Journal story, raising children with an attitude of gratitude can help them have better grades and be less likely to experience depression. As a parent, helping your kids understand gratitude can mean more peace of mind and less stress and unrealistic standards to meet overall. Here are 5 ways to help your children become more grateful for that they already have. This is hard, because as parents, we want to give our kids the best and all that we never had. There’s just one problem with this logic: the world doesn’t work that way. When you become an adult, you don’t always get your way, and things don’t always work in your favor. It’s okay to give your son or daughter a great childhood and provide some of the things they desire, but know when to draw the line when it comes to material items. Instead of caving in and giving your child what they want all the time, switch your answer up and say no so they can start to cherish and take care of the things they have and make do with less. This is something I do with my son all the time. Instead of asking your child to clean up their own room all the time, when they get old enough to do so, consider helping them organize and declutter every few weeks. When I get ready to go through my son’s room with him and organize all his toys, he gets excited because he always rediscovers an old item he forgot about and falls in love with it all over again. Kids can have short attention spans, so it’s important to clear up the clutter and remind them of all that they have. Plus, reorganizing your child’s room is a great way to uncover some items that you might consider donating to charity so you can get them involved in that as well. One of the worst things you can do when raising your child is allow them to grow up valuing material items over people and experiences. Try to implement different experiences that don’t cost much into the quality time you spend with your child. Teaching your child how to grasp a concept like gratitude may be easier by taking a direct approach depending on how old they are. If you think they are able to understand what it means to be grateful, explain the concept to them and either start a gratitude journal together where they can draw or write about the things they are grateful for, or start a nightly or weekly discussion allowing your child to express how their day went and what they were grateful for. Having conversations like this and doing similar exercises will help your child see the silver lining behind the events that occur in their life each day. When I was a child, I’ll never forget an experience I had where I went with my church to feed local homeless people. At the time, it felt great to give back, and I started to become more thankful for the things in my life after I saw people who were in a worse situation than me. I know it’s not politically correct to compare yourself to others, but once you realize that there will probably always be someone doing better than you and someone doing worse than you, you start to become more thankful for where you are in life. If you can find a service program or activity in your neighborhood that allows your child to actively give back to the community and help others who are less fortunate than your family, it may be very eye opening for them because a child can’t learn more about the world and themselves if you don’t open them up to that experience. 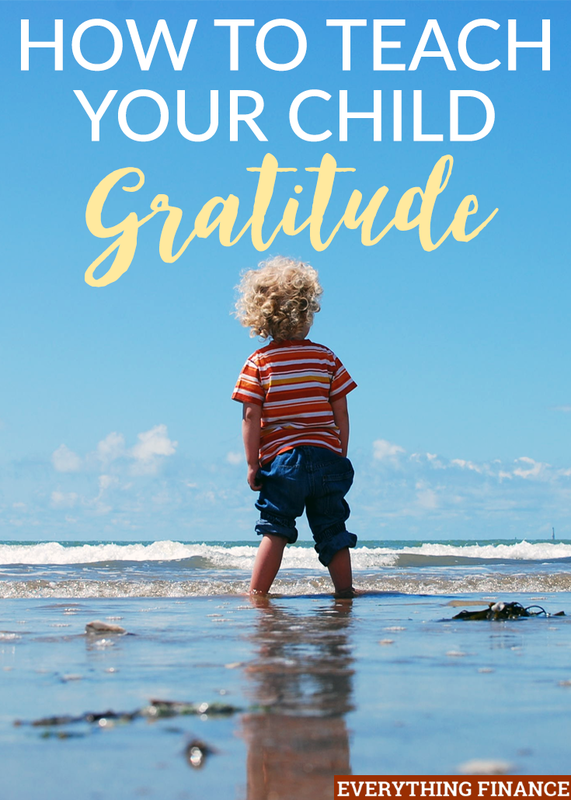 Not the dividends you obtain from investing of course, but all the time and effort you invest in allowing your child to understand gratitude and change their mindset will most likely pay back tenfold. I see the benefits of teaching my 6-year-old about gratitude already when we walk past the toy aisle in the store and he doesn’t throw a tantrum and embarrass me, when his attitude didn’t get worse after he found out I wasn’t able to get him the toy he wanted most for Christmas, and when he comes up to me and says thank you for the little things on his own. Thankfulness and gratitude is a priceless attitude for anyone to have, but it’s amazing to see your kids develop it. If you have kids, have you started teaching them about gratitude yet? Which one of these techniques would work best for you?